Pack a basket to picnic in style. Select a cool spot downtown. If the common spots don't attract you, pick up a less crowded one. Try to keep requirements to a minimum. Pack plastic plates and cups. Take lots of absorbent paper towels as well as colorful paper napkins. Cooler(s) to keep the food fresh and drinks cool. Irrespective of the sight you select, make sure you provide a varied enough selection of food. And that too in sufficient quantities to support the lunch and afternoon snacks as well. No need to go in for a gorgeous pack up. Even, simple foods can make the most elegant picnics. For instance, the smoked salmon sandwiches, a pot of lumpfish roe, smoked fish pate, some special cold meat pie, spicy meatballs, a pizza slice that cuts into fingers neatly, bowls of dip and bought chips to dunk. For a large picnic, decorate an old sheet with lots of simple appliqué flower shapes in different colors. Stitch ribbons of red, white and blue on the corners and halfway along the sides, then tie these to meat skewers or tent pegs and hammer them into the ground to prevent the cloth flying away. You can also paint some gravels in red white and blue. It's a nice time pass before getting started with the food. Lay them on all corners to weight down the cloth. Remember, the post picnic wrap up is no less important than the pre-picnic pack up. Never leave the place littered with left-over food, beverage bottles and plastics. 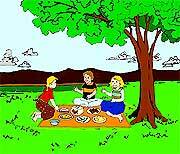 Remember cleaning plays a vital role in a picnic. It's the responsibility of the picnickers to keep the trash to its minimum. So don't try to litter around in an unwarranted manner. It will ease down your clean up job. It's convenient where the local authority provides the disposal facility. What you all need to do is just collect everything in a bag and dump the bag in a place meant for this. Where no such facility is available, it makes the job more difficult. And you need to be more careful then. First of all, you need to collect the trash in the disposal bag. Then you are to carry the bag with you. At least up to the nearest dumping ground or vat.